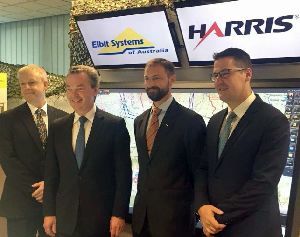 Canberra, Australia -- Elbit Systems of Australia Pty Ltd (ELSA), a wholly owned subsidiary of Elbit Systems Ltd., hosted the Australian Minister for Defence Industry, the Hon Christopher Pyne MP, Senator for the Australia Capital Territory, Zed Seselja, The Chief of the Army, Lieutenant General Angus Campbell, AO, DSC at its facility in Canberra, marking the award of Tranche 2 of the Australian Army’s Land 75/125 program. Elbit Systems reported this contract award on September 27, 2017. The program is the extension and enhancement of the Australian Army’s Battle Management System (BMS) originally procured under the Land 75/125 Program.